LOCATION.--Lat 40`10'26", long 74`57'26", Bucks County, Hydrologic Unit 02040201, on left bank at bridge on State Highway 213, 0.3 mi downstream from Mill Creek, and 1.7 mi west of Langhorne. PERIOD OF RECORD.--October 1934 to current year. GAGE.--Water-stage recorder and crest-stage gage. Datum of gage is 40.57 ft above National Geodetic Vertical Datum of 1929. Satellite telemetry at station. COOPERATION.--Station established and maintained by the U.S. Geological Survey. 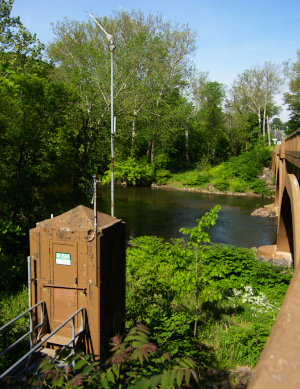 Funding for the operation of this station is provided by the Bucks County Commissioners, the Pennsylvania Department of Environmental Protection, and the U.S. Geological Survey. Supplied by NWS: Action stage-8 ft, At 7 ft, water begins to overflow the lowest banks, on both sides of the creek, into adjacent wooded areas; Flood stage-9 ft, Flooding begins on Bridle Drive in Middletown Twp. At 10.5 ft, Rte 413, near Bridgeton Pike in Middletown Twp, is subject to closures due to flooding; Moderate flood stage-12 ft, Widespread flooding occurs on Bridle Drive in Middletown Twp. The road becomes impassable; At 13 ft, Periwinkle Drive in Middletown Twp begins to flood; Major flood stage-14 ft, Residential properties are flooded on Bridle Drive in Middletown Twp. Flooding also occurs on Business US 1 in Middletown Twp near Rising Sun Avenue. Flooding is also possible further downstream in the Croyden Section of Bristol Twp.